Brook Farm Fishery is set in rural surroundings, with easy access to the M25 and other major roads it is approximately 4 miles from Gallows Corner, easily reached by the A12 or A127. There is a sign for Brook Farm Fishery outside the entrance. At Gallows Corner take the third exit into Straight Road towards Harold Hill. Proceed for 1.1 miles to the traffic lights at the end of Straight Road. At the light turn right followed by an immediate left into Brox Hill. Proceed for 1.4 miles up the hill and, at the top of Brox Hill, turn right onto the B175 towards Havering -Atte-Bower and Stapleford Abbots. Proceed for 1mile and turn right into Tysea Hill. Once in Tysea Hill proceed straight. The road becomes Murthering Lane. 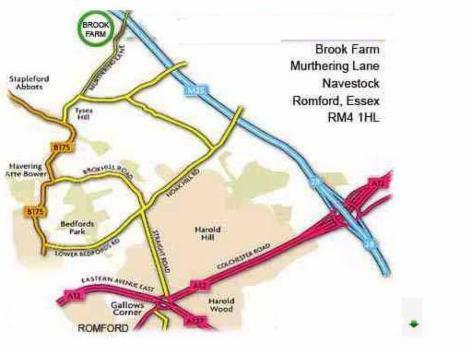 Brook Farm is on the left, about 1.4 miles from the beginning of Tysea Hill and 300 metres before the bridge over the M25.